i initially planned to wear this outfit without the t-shirt, and just wear the lace dress and cardigan, but i felt the urge to wear this top. it's super old and i actually wear it to sleep in usually, but i wanted to show my love for morrissey this day. i like how i could just about manage to peek the little peterpan collar of my dress over the top of it. pictures 1 & 2 demonstrate the annoyingness of the sleeve length of this coat. it'll be fine in spring when i'm wearing short sleeves underneath but when it's still pretty damn cold and i want to wear a cardigan, there's some severe overlapping. oh well, i'll pretend i did it on purpose, like some kind of mega cool layer-er. these woolen tights kept falling down allll day and frustrated me beyond words. i hate tights that fall down over your arse and you have to keep yanking them up and flashing your bum at people all day! 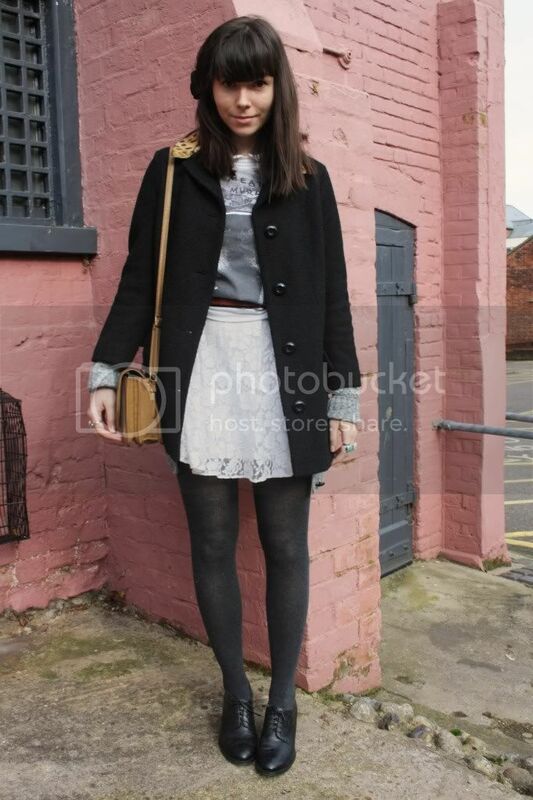 such a cute outift :) love the peekaboo collar! This outfit is amazing. I love the tshirt with the more feminine lace dress as a bottom! know what you mean about the layering-coat-thingy it kinda freaks me out sometimes too and about the tights: also true! anyway,nice outfit, love the lace dress. Love the whole look & that cardigan! Random question - do you wear your blog outfits to work? I've recently started a new job in an office and need work outfit inspiration! i love your lace skirt! and i really like your layering of the cardigan and coat! I think that the sleeves peaking out from under the coat look really cute, haha. For me I find that coats are just big on me in general and so the sleeves go to my hands. But then again I don't usually need gloves. I want that tshirt so bad, Morissey was actually at the night club I was at the other day, missed him by five minutes apparently (my friend was beside him) I was so upset! Haha, love the last sentence! But I love your outfit even more! I actually like the way your coat's sleeve allowed for the cardi's sleeves to peek through, it looks good! 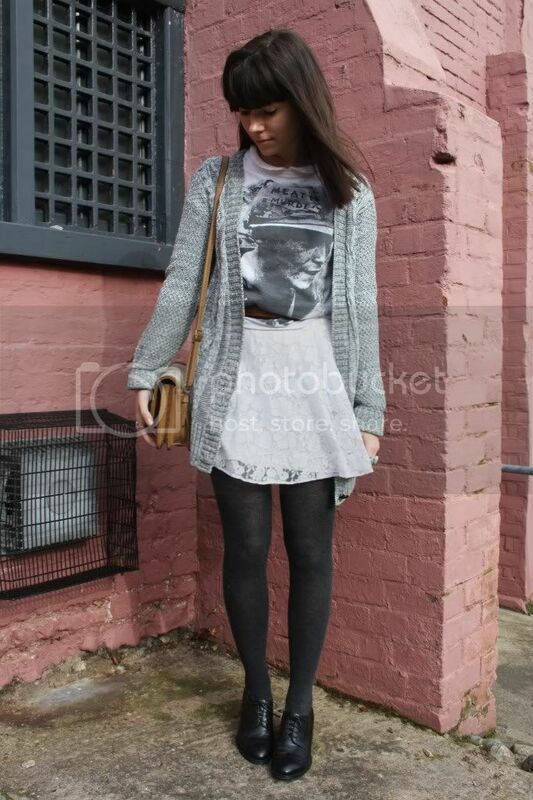 I love your tee, it's awesome, and your shoes too - very sophisticate! I love this outfit, like all your outfits. I think every coat I own has a cropped sleeve. I know it's not practical but I think they're lovely and instantly make a coat look more chic. But it may also be something to do with my slight Jackie O obsession... Anyway, lovely outfit, your hair always looks fab. Amazing outfit! Much love for The Smiths. Very sweet outfit! Oh beautiful mozza! Loooove The Smiths and Morrissey! I'm seriously in love with this whole outfit, especially the skirt it's so dainty! The layering is great! One of my fave outfits! I love this white skirt. Just came across your blog and I´m truly amazed! Your style is so adorable and british (that´s a compliment)! Super cute! I love The Smiths too. I have this coat. I waited til the sales and got it for £30! Soo happy! I can see what you mean about the sleeves. I'm very short so my arms are quite short too. I find them to be a little on the short size so I have no idea how an incredibly tall person could wear this comfortabley. It looks lovely on you though! I actually quite like how the cardigan juts out. I saw that they had this coat in red too. I'm currently trying to resist buying it!! Love your blog. Your outfit posts are pristine! PS. Got there in the end! I kept leaving off that it was me (Bryden) posting and not Claire. I think I need an early night tonight! !